This dialog lists all packages currently defined in the running Lisp. Nicknames, Use List (i.e. 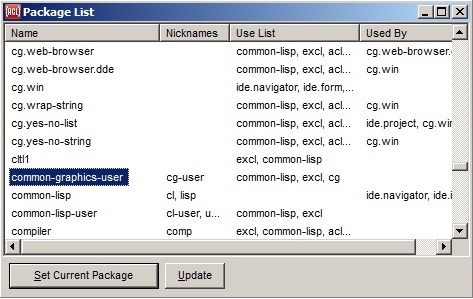 the list returned by package-use-list applied to the package) and Used-by Lists are also displayed. The display is not updated automatically. To see changes since the last update, click on the Update button. The current package in the IDE Listener Thread (the value of *package* in the Debug Window) is selected when the dialog is displayed. Select the package in the dialog's list and then press the Set Current Package button. Select the package in the list and then press the ENTER key. Double-click a package in the list.